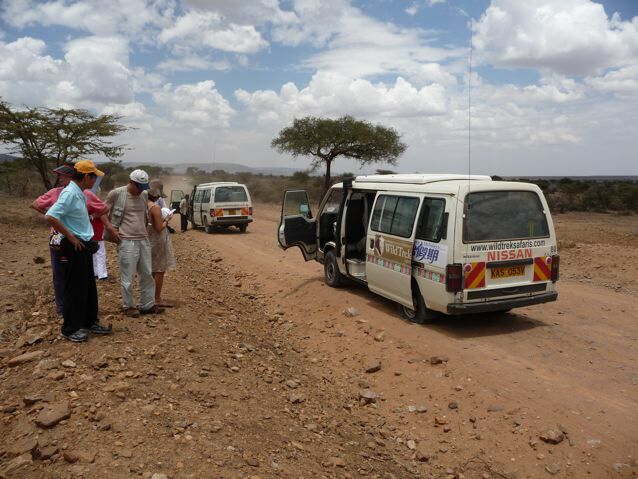 As tourists in Kenya, we were driven everywhere in a safari van. We had the unfortunate fate of having a speed demon as our driver. 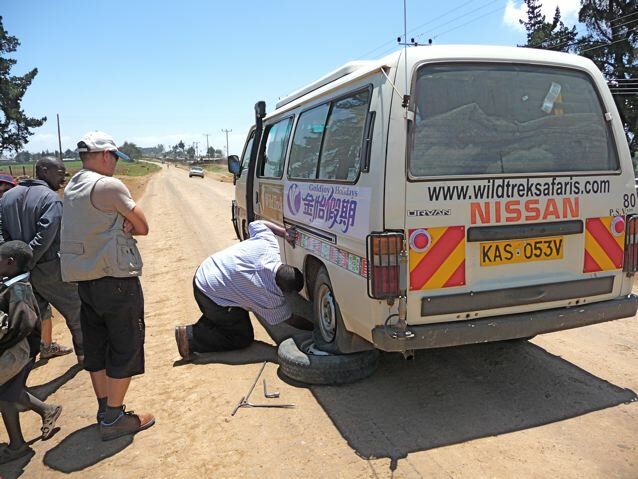 Our van had three blown tires, all on the same wheel. The tires were all Michelin tires which I trust, yet they were destroyed one after the other. Sally is allergic to prolonged exposure to the sun. I made her a collapsible sun shade for the tour and she gave it the stamp of approval. The vans were rear wheel drive Japanese vans with openable roof. 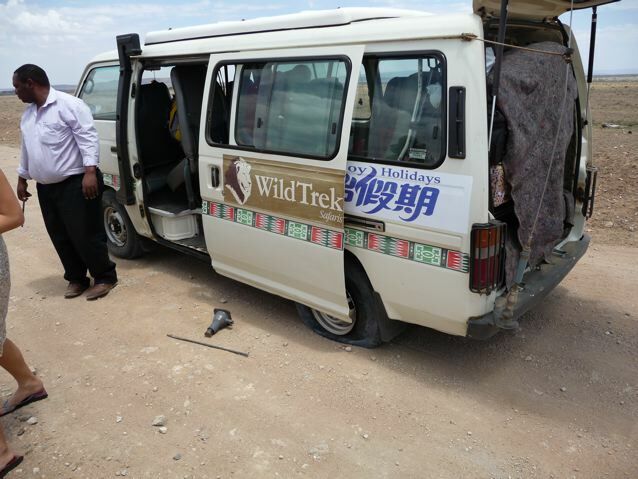 The driver swore by Japanese vehicles, praising their toughness. 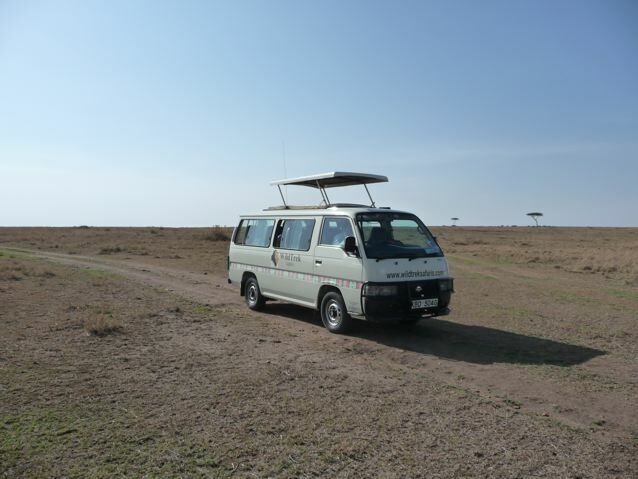 I was amazed by the ability of the vans to ford streams, climb steep inclines and gallop on open grassland. They performed like four-wheel drive jeeps. 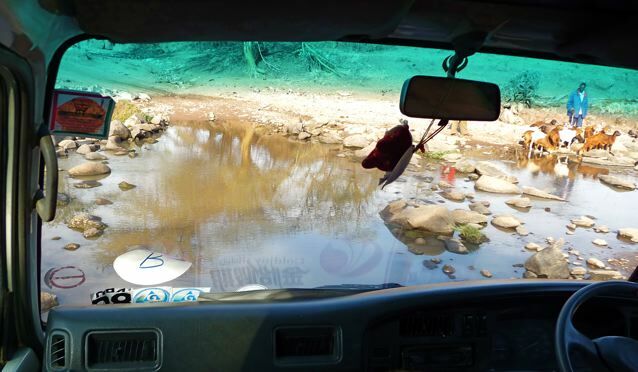 We were not allowed to leave the vans to protect us from the animals. I used the camera extension I made to take this photo of us standing in the cage. As usual, I was the docile mule. 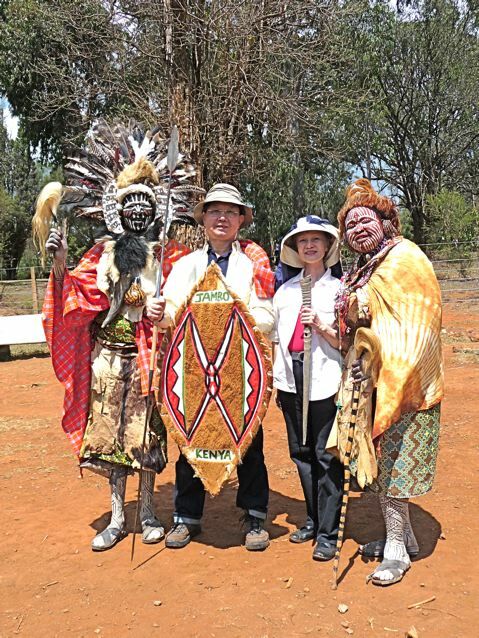 As tourists, we had our obligatory picture taken with quasi-witch doctors. “Jambo” is hello is swahili and is used as the common greeting. We traveled mostly in Masailand. While some Masai tribesmen adopt western clothing, most retain their colorful tribal costume. 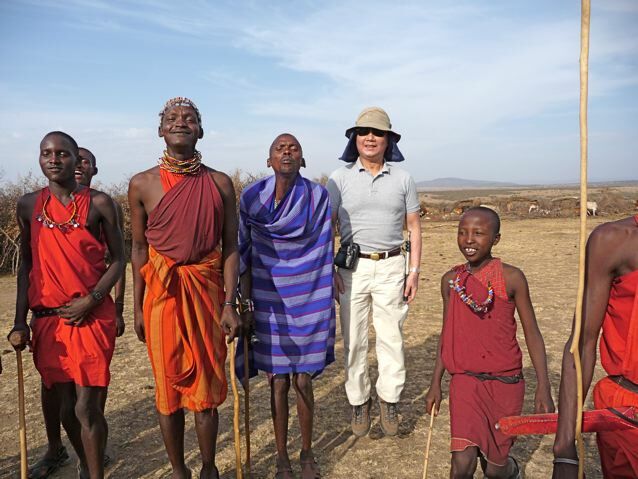 All Masai men in tribal costume carry a sheathed sword on their waist, reflecting their fierceness. 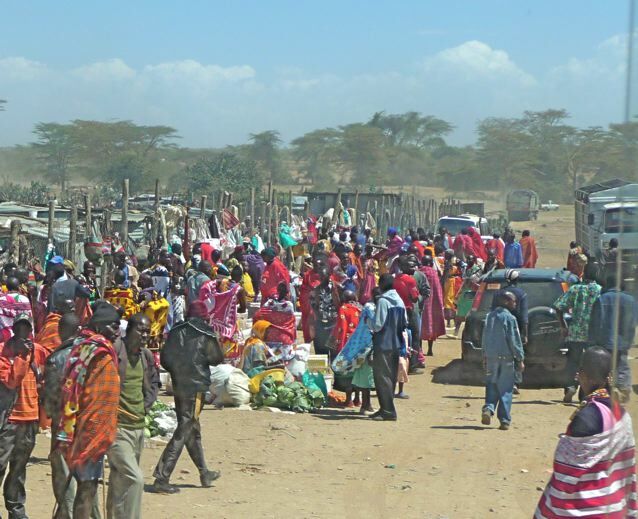 This is a Masai market. 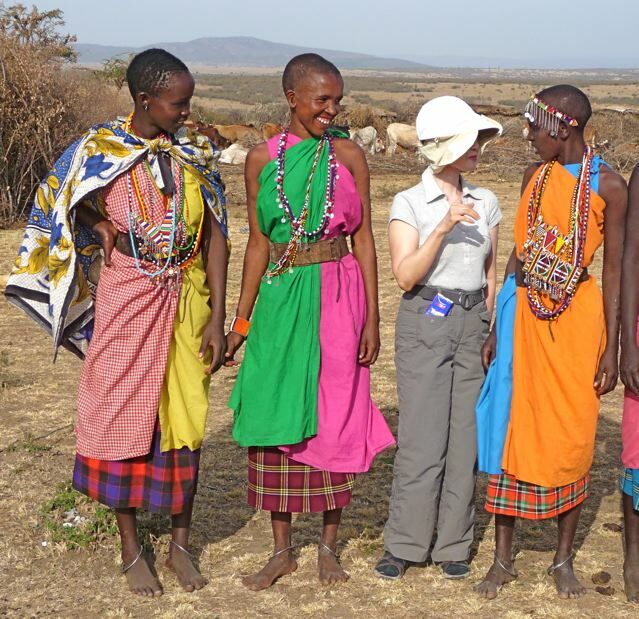 When visiting a Masai village, sally struck up a friendly conversation with the women. I danced with the men. This picture testifies that I can leap high, making me a desirable man to marry. 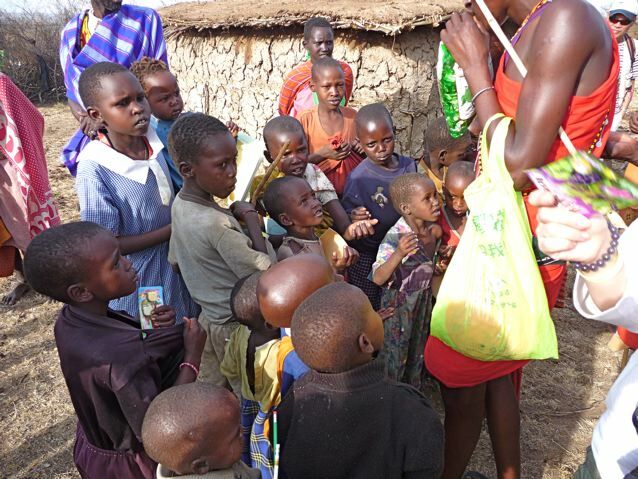 The children waited impatiently for candies brought by the tourists. This warrior in his cow dung shed showed off his weapons: spear, sword and war club. 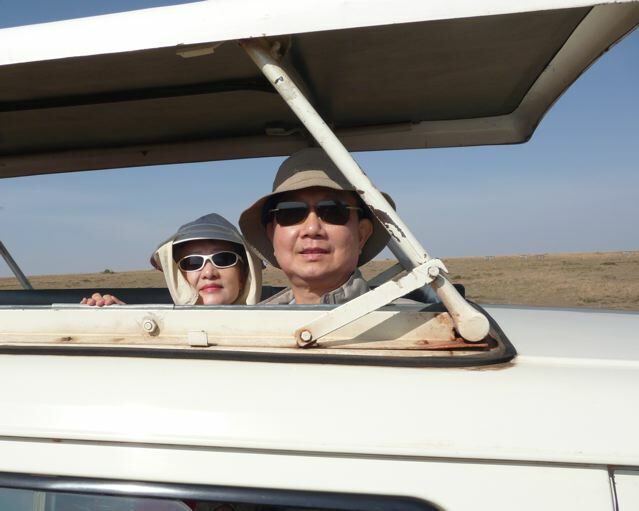 he claimed to have killed a lion two weeks earlier, but I believe it was just a tourist schpeel. 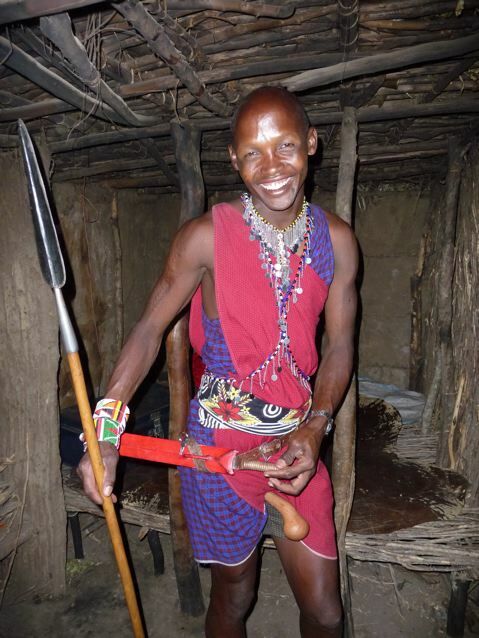 Masai men clamp articles between their legs when they want to free their hands, not intending to be impolite. 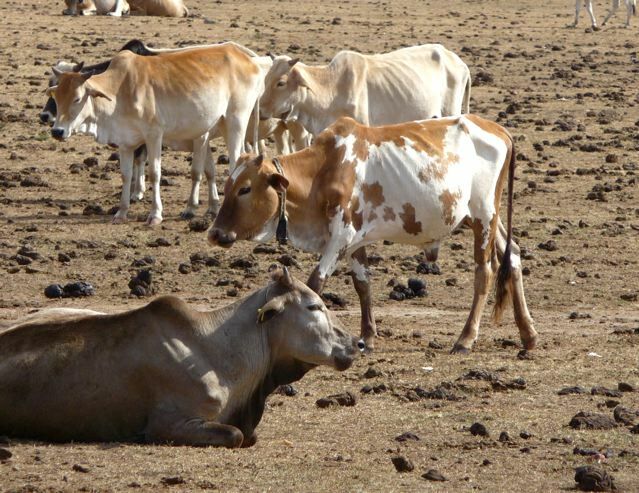 The three year drought in Kenya causes the Masai’s prized cattle to become bags of bones. This cow wore a cow bell to warn off lion attacks as lions fear masai who would hunt them down and kill them. 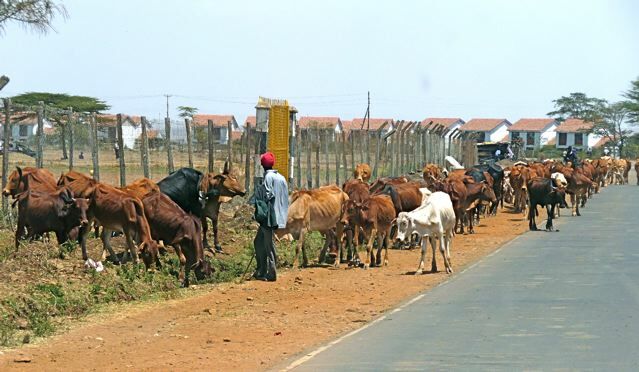 The drought drove these Masai to bring their cattle into the city of Nairobi to graze. 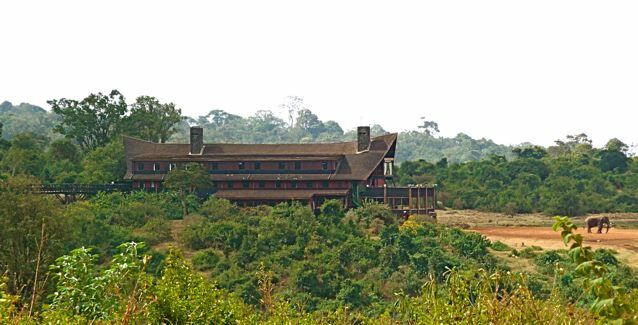 We stayed one night at this hotel in the Aberdare national Park. It is built next to a salt lick where many animals would come at night to eat the dirt and get salt into their bodies. When significant animals showed up, a buzzer would sound and wake us to see the animals. To our disappointment, the buzzer did not sound even once during our stay. I did catch a beautiful sunrise. 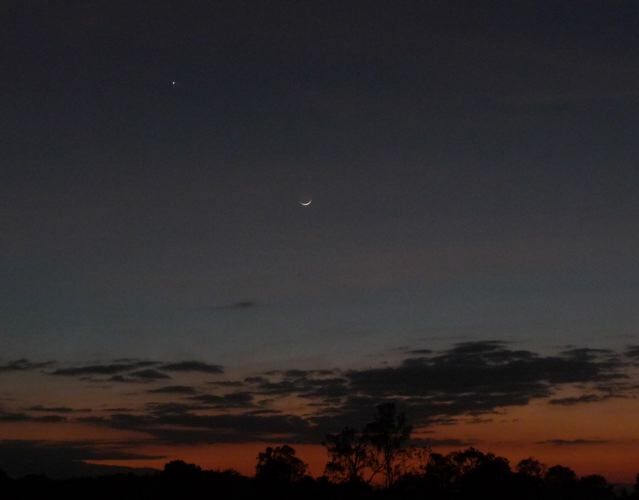 The moon and the star made this a Muslim sunrise. My first cup of coffee was delicious. 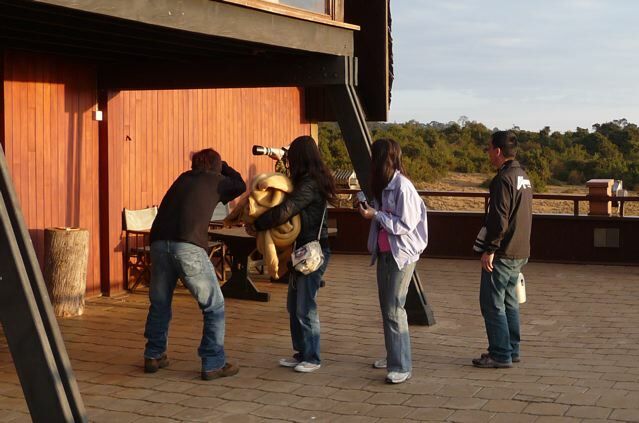 As they did not catch significant animals with their cameras, these desperate tourists flocked to photograph a moth on the wall. 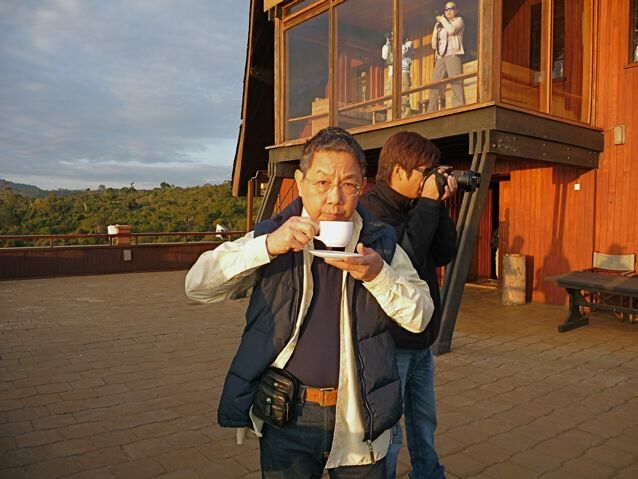 We also stayed in Mt Kenya Safari Lodge, built partly by movie star Willaim Holden. It is still maintained very well. 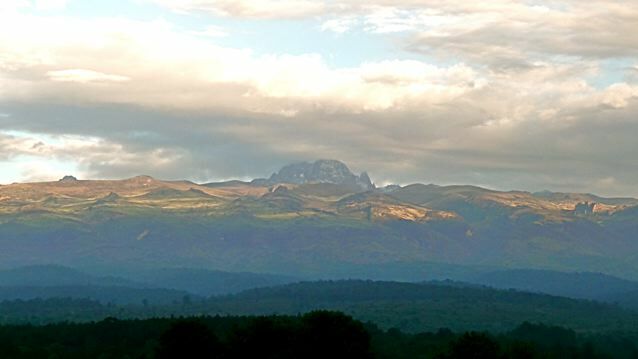 I caught Mt Kenya on top of layers of trees and foothills. 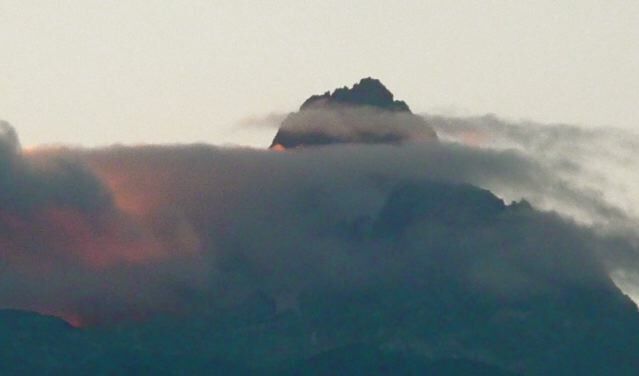 The next morning, I caught Mt Kenya lit up next to a flaming cloud. 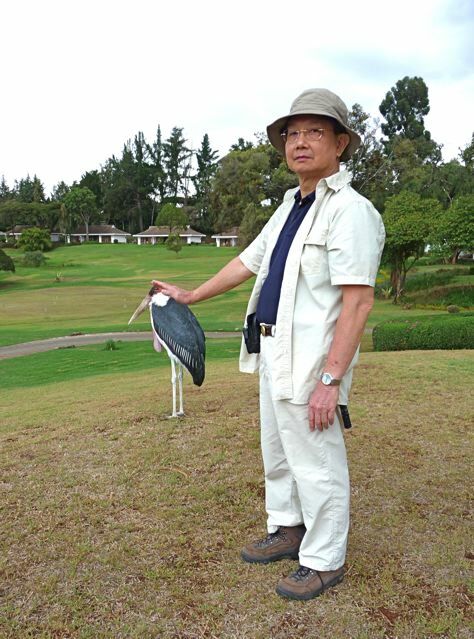 Sally had two guards of marobou stork, carrion eaters that usually fight with vultures for food. 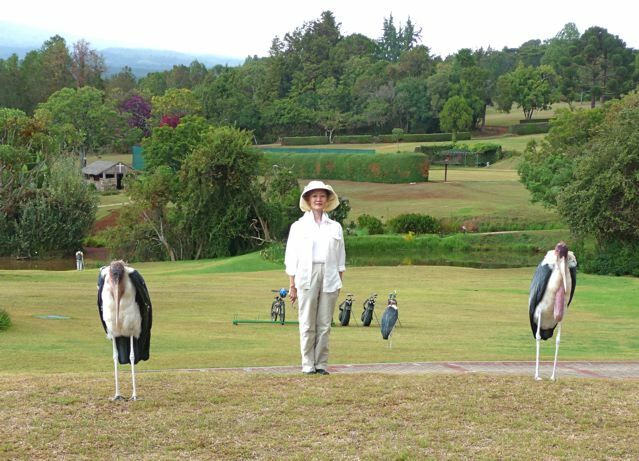 I patted the marobou stork for being a diligent guard for Sally. 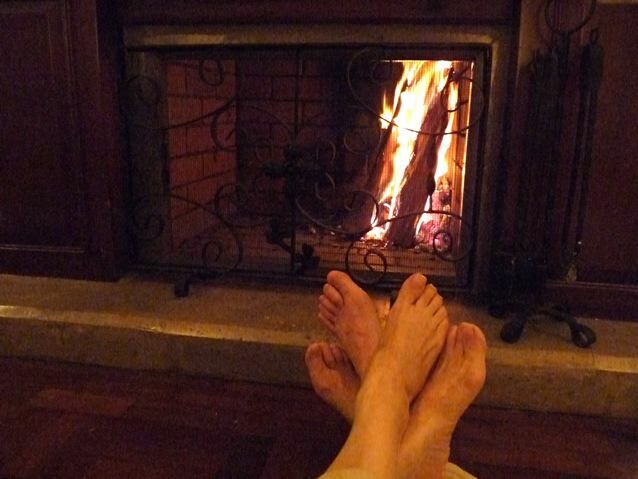 Our hotel room fireplace was lit and we enjoyed the warmth of the burning logs. We travelled at elevations of 5,000 – 7,000 feet. 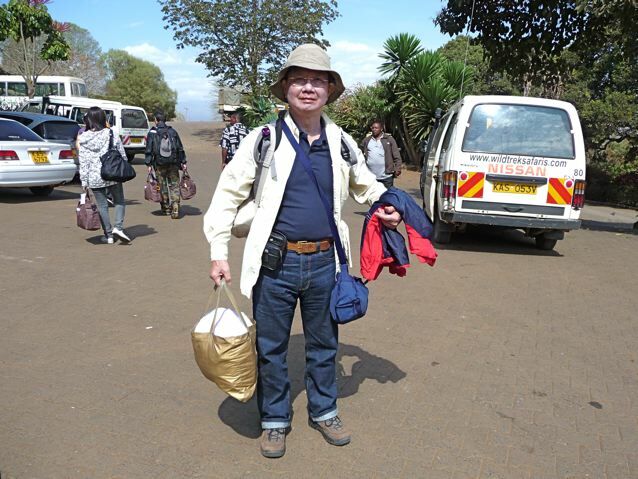 Even though the hotel was right on the equator, it got cold at night. 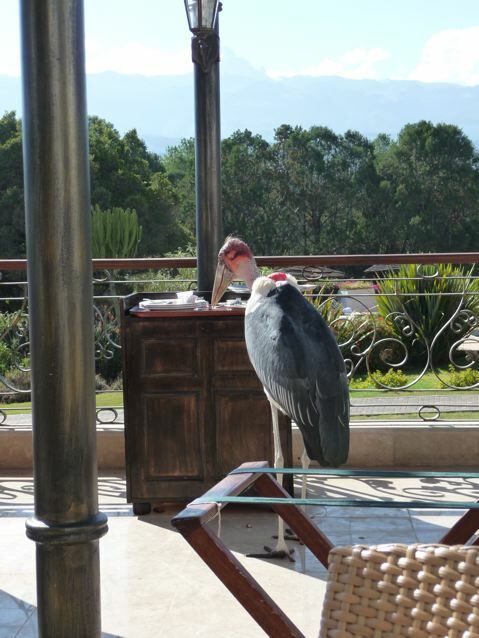 One marobou stork helped itself with guests’ breakfast leftover. African native food is nothing to speak of, being just subsistence food. Our tour group ate Western food exclusively, and they were just average. 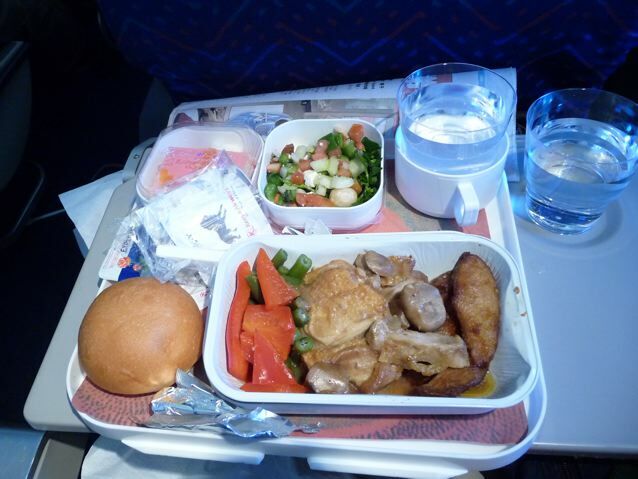 I found the airline food served by Air Kenya to be particularly delicious, even better than business class or first class meals I had before. This meal turned out to be the best meal I remember having on this trip. 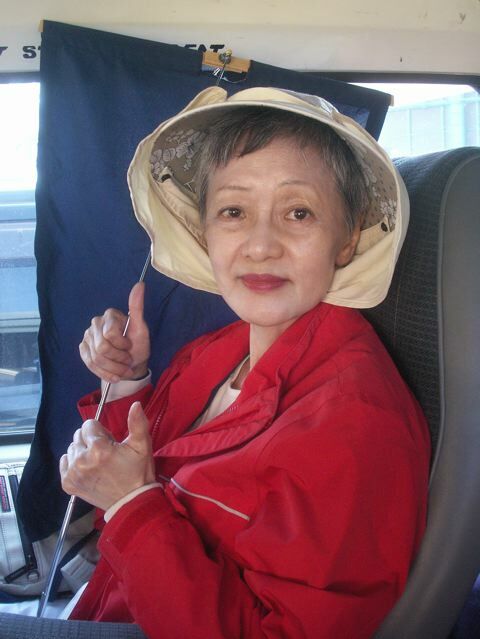 Posted by Robert Wu on Sunday, October 4, 2009, at 9:58 am. Filed under Uncategorized. Follow any responses to this post with its comments RSS feed. You can post a comment or trackback from your blog.